Riveting romance set in Afghanistan during the war in the 1970s. Against all odds, two lovers from different cultures, strive to maintain their relationship despite the differences between them. Award winning author, Nasir Shansab, writes an excellent novel that brings in the terrible war conditions of Afghanistan during the 1970s. An advocate for the people of his native Afghanistan, Nasir continues to speak publicly to better the lives of those living in this war-torn country. 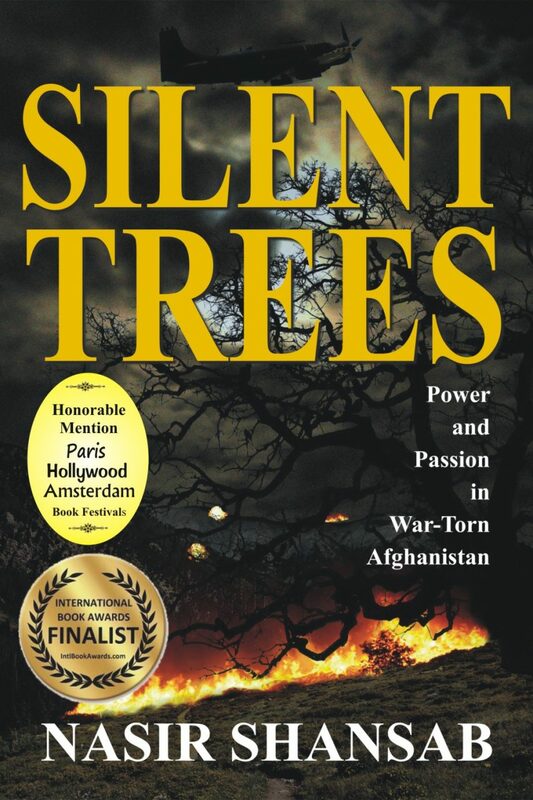 Silent Trees: Power and Passion in War-torn Afghanistan by Nasir Shansab is a haunting story of a country on the verge of chaotic collapse. Most of the book is set in the late ’70s, before the Soviet invasion. It is told from the viewpoint of several major players, most notably the businessman Habib Dhil. Despite assurances from American acquaintances that things are ‘stable’ in his home country of Afghanistan, Dhil has the intuition that this is not the case, and that the fragile stack of cards that is a corrupt government is about to come crashing down. Other viewpoints include Maggie Reed, an American lover of Dhil’s, Miriam, another lover, and two of Dhil’s friends, Anwar Haq and Alam Gol. Each is connected to the other, and we hear each perspective of this interwoven story. I was very quickly drawn into the lives of these characters. There were no ‘heroes’ among them. They were average, everyday people trying to survive in harsh circumstances. Some of them did some pretty horrible things, yet I still found myself hoping for the very best for each of them. The writing is mostly prose, poetic and flowing. It was certainly easy to envision myself as part of the story. A scene near the beginning that I really became drawn into was a vision Maggie had of a long ago battle on the grounds of an old fort site she was visiting. The description was so vivid that I could hear the thunder of hooves and the clash of swords, and see the frenzy of said battle raging around me.